The Arrow's Modified Roundtail incorporates an asymmetrical design that allows for an even greater stride experience for both men and women. The Arrow's design allows each step to nest, providing for a more natural stride when traversing a step grade, or walking the local trail. The Modified Roundtail incorporates the floation of our traditional roundtails with the maneuaverability of our v-tail designs. The Arrow balances the two perfectly. CRAMPONS: Sure Grip™ crampon system with stainless steel front and rear crampons for stability. Powdered caoted to shed snow and ice. FRAME: 6000 Series Aluminum. Unique modified round tail design for maximum floatation. The asymmetrical design allows each step to nest for maximum stride experience on all terrains. BINDINGS: SUMMIT- Injection molded with a rugged "stand up" design for easy entry and exit. The Summit features three straps that secure your foot tightly in place without pinch points. Fully moded sides provide lateral stability yet accommodates a wide range of shoe sizes. Special UV-resistant "Reflex" material maintains a soft feel in the coldest temperatures. HINGE: Live-Action Hinge lifts the tail of the shoe from the snow with every step - for added mobility and speed. model 22 | weight: 3.0 lbs. user weight: up to 150 lbs. model 25 | weight: 3.3 lbs. user weight: up to 175 lbs. model 30 | weight: 3.7 lbs. user weight: up to 220 lbs. model 36 | weight: 4.7 lbs. user weight: over 220 lbs. Note: Snowshoe weights are approximate. Perfect all around snowshoe for east coast conditions. Light weight, easy to use. Perfect for hiking and light trail running in winter snow. Ever been bored on a snowy day not able to go anywhere because the snow is too unbearable? Well the answer is here! 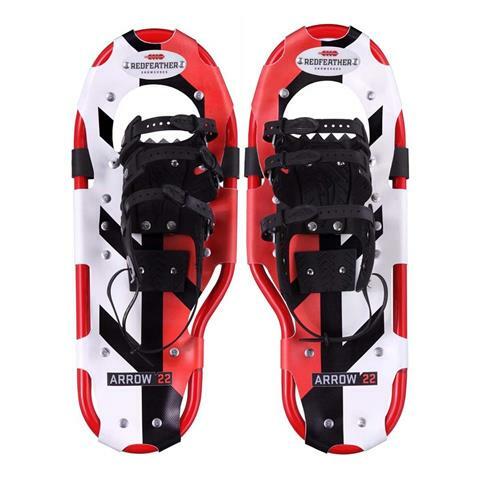 These snow shoes will help you get to your destination even if the roads are closed!